Aharon Megged (1920-2016) was born in Wroclawek, Poland, and came to pre-state Israel when he was six. He lived on a kibbutz for many years, working in agriculture and fishing. 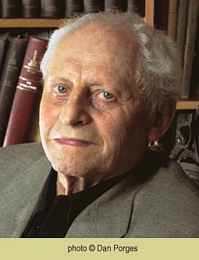 Later, he became a journalist and literary editor, served as cultural attache in London, and was writer-in-residence at Oxford and Haifa Universities. He served as president of the Israeli branch of PEN from 1980 to 1987, and was a member of the Academy of the Hebrew Language since 1980. Megged published over 40 books. 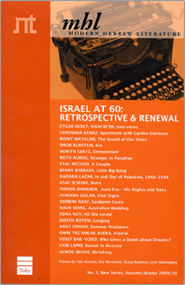 Among his many literary awards: the Ussishkin Prize twice (1954; 1965), The Brenner Prize (1958), the Shlonsky Prize (1963), the Fichman Prize (1979), the Bialik Prize (1973), the Kenneth B. Smilen/Present Tense Literary Award (USA, 1983), the ACUM Prize (1990), the Neuman Prize (1991), the Agnon Prize (1996), the WIZO Prize (France, 1998), the Prime Minister's Prize (1998; 2007), the President's Prize (2001), the Israel Prize for Literature (2003) and the Koret Jewish Book Award (USA, 2004). He also received an Honorary Doctorate by Bar-Ilan University (2008).